Dean Henderson is the latest English youngster to be pencilled in for a move to Germany with Bayern Munich understood to be keen on the Manchester United starlet. 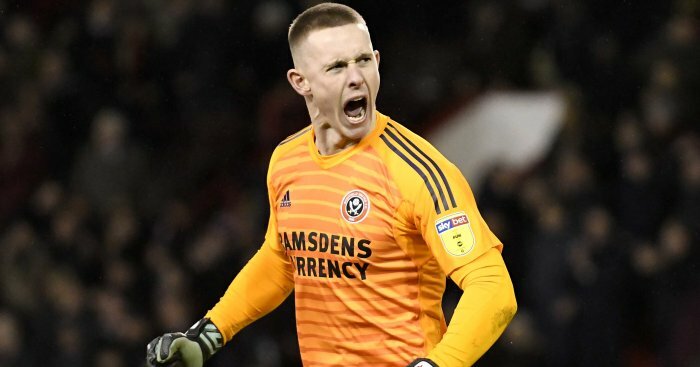 The 21-year-old goalkeeper has been earning rave reviews on loan at Championship promotion chasers Sheffield United and the Bundesliga champions are just one of a clutch of clubs tracking his progress. ESPN report that Juventus are also keen on Henderson, while Arsenal and Tottenham are also interested in the England Under-21 goalkeeper. Henderson’s progress has been clear over the last couple of years after spending a 12-month loan spell with Shrewsbury last season and being named in the League One team of the year. The Shrews turned out to be the surprise package last term with Henderson instrumental and finished in the play-offs before losing in the final to Rotherham. He then penned a a new two year contract at United, who also hold an option to extend the deal by another 12 months, in the summer and was loaned to Sheffield United. Henderson’s progress has maintained an upward curve in the second tier and he has been an ever present and played every minute of the Blades’ 30 Championship games, helping them into third place. Henderson has claimed 10 clean sheets this season, but he made a cryptic Twitter post in December, which may have been aimed at his lack of opportunities at Old Trafford. The Whitehaven-born keeper may not be happy playing for United’s U23s next season and may just be looking for a permanent move in the summer after two seasons of regular first-team football.